Over in our Facebook group (where we now have over 599,900 members it keeps going up each week!) 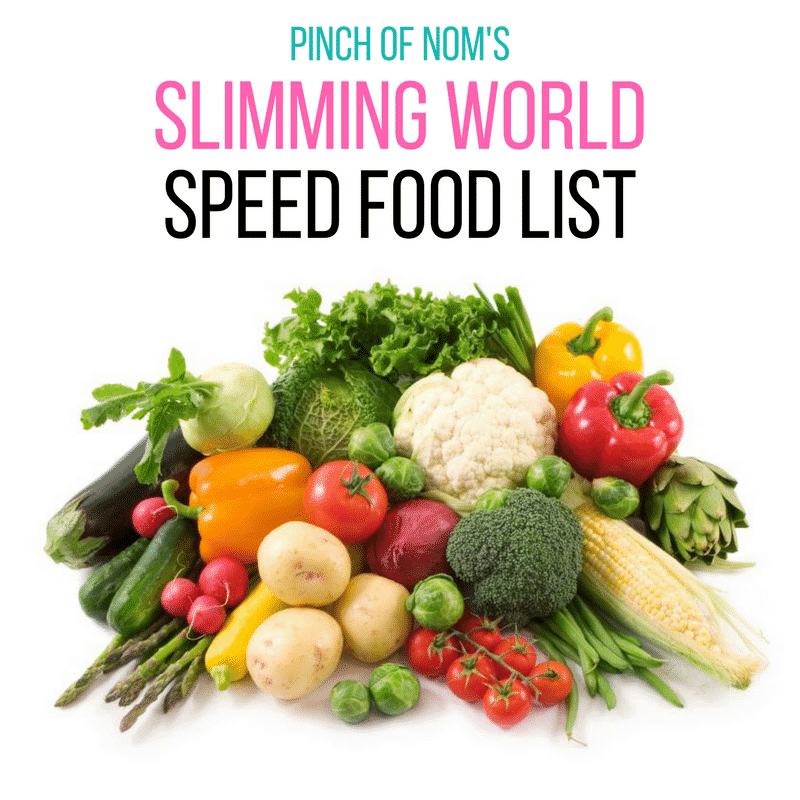 one of the hot topics of each week is spotting new products that are Slimming World friendly, for our Slimming World Shopping Essentials list! We always try to look for a range of Free Foods, some Speed Foods and a some different ways to use your Syns allowance in our Shopping Essentials round up. I’m always looking for a lunch option I can grab when I’m out and about. When you’re following Slimming World you don’t want to waste Syns on a prepacked sandwich or meal deal. 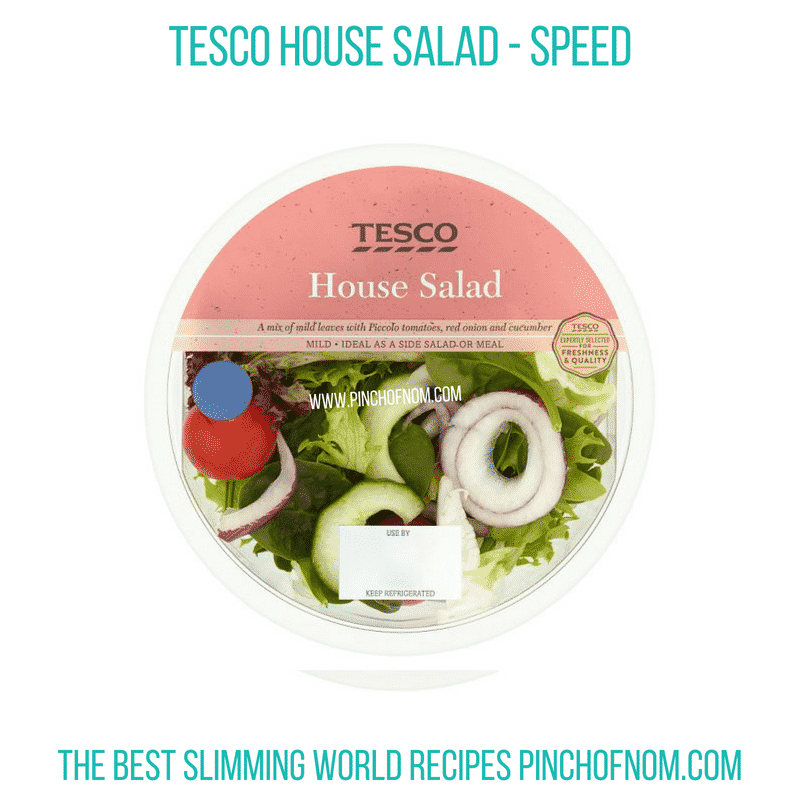 A salad bowl like this Tesco House Salad is an easy choice, as it’s full of Speed Food; Apollo, lollo rosso and iceberg lettuce leaves, tomatoes, spinach, red onion and cucumber. 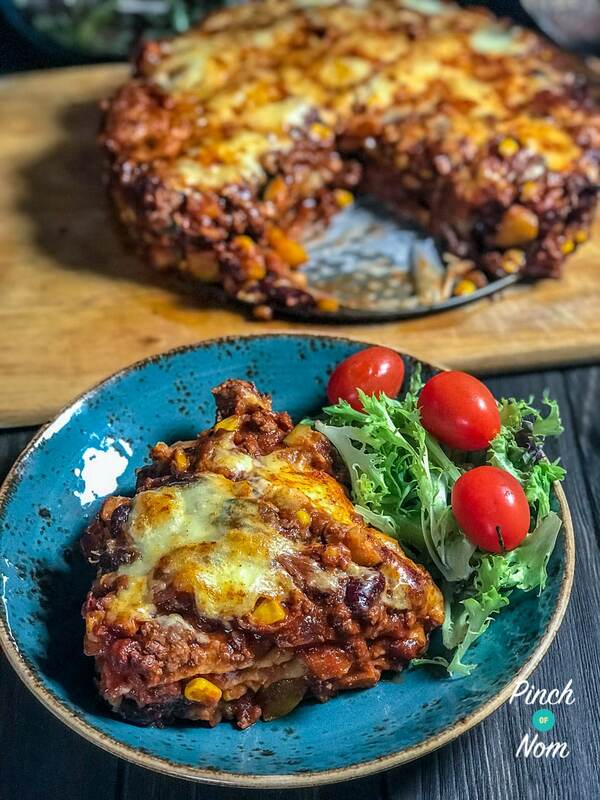 You could also use it as a side salad to serve alongside a main meal, such as our incredibly popular Syn Free Enchilada Lasagne. Nom nom nom! Tesco House salad costs £1.00 for a 120g bowl. You can find it here, on the Tesco website. Adding protein to a salad will help to keep you feeling fuller for longer. This King Prawn Addition pot from Tesco is designed to be added to a salad bowl such as the one above. In last week’s shopping essentials, we featured Hellman’s Fat Free vinaigrette dressing, which would be ideal to add to your salad and give it a bit of zing with no added syns. 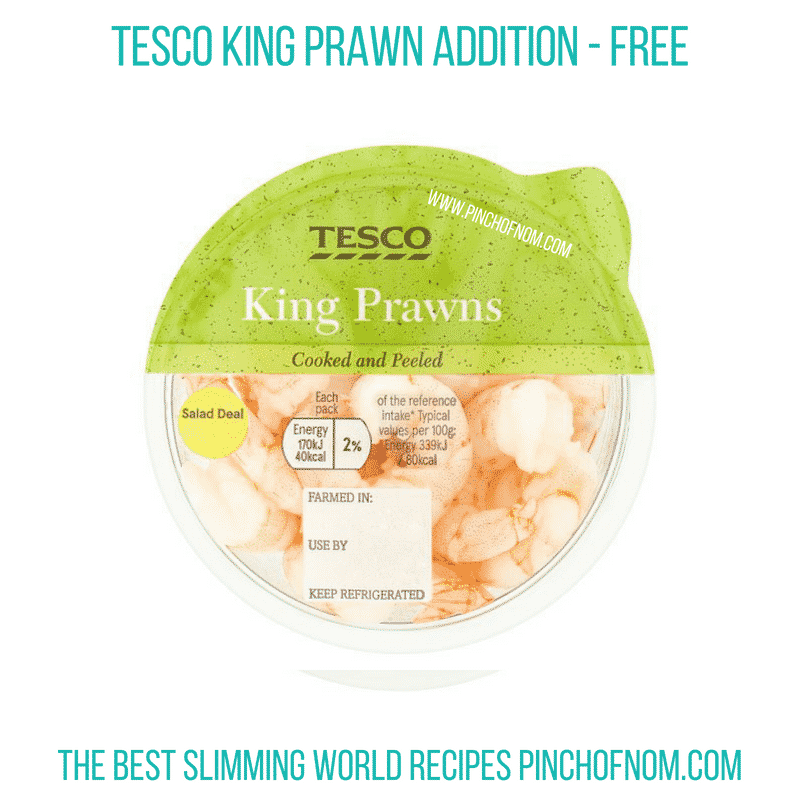 Tesco King Prawn salad additions pot is Syn free and costs £1.50 for the 50g pot. You can find it here, on the Tesco website. If you don’t fancy prawns with your salad for lunch, how about some chargrilled chicken instead? You can eat it as a snack on its own, or build lunch around it by adding other free or speed food. This is another protein pot that is can be added to a plain salad bowl for a more satisfying lunch. We’ve used the Syns calculator to check the Syns and it’s free. 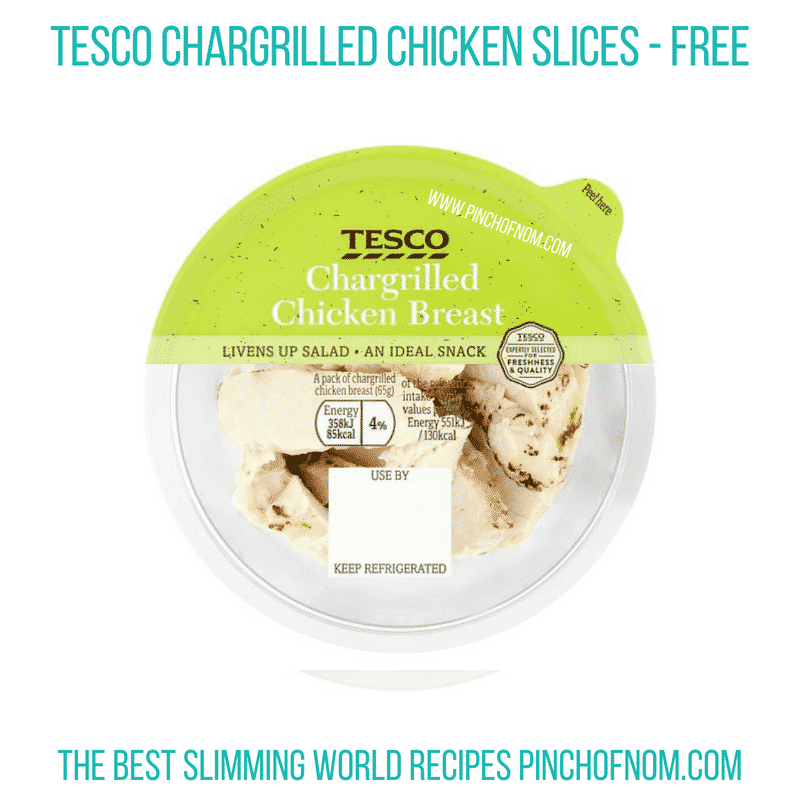 You will find this Chargrilled Chicken Slices pot in Tesco, priced at £1.50. 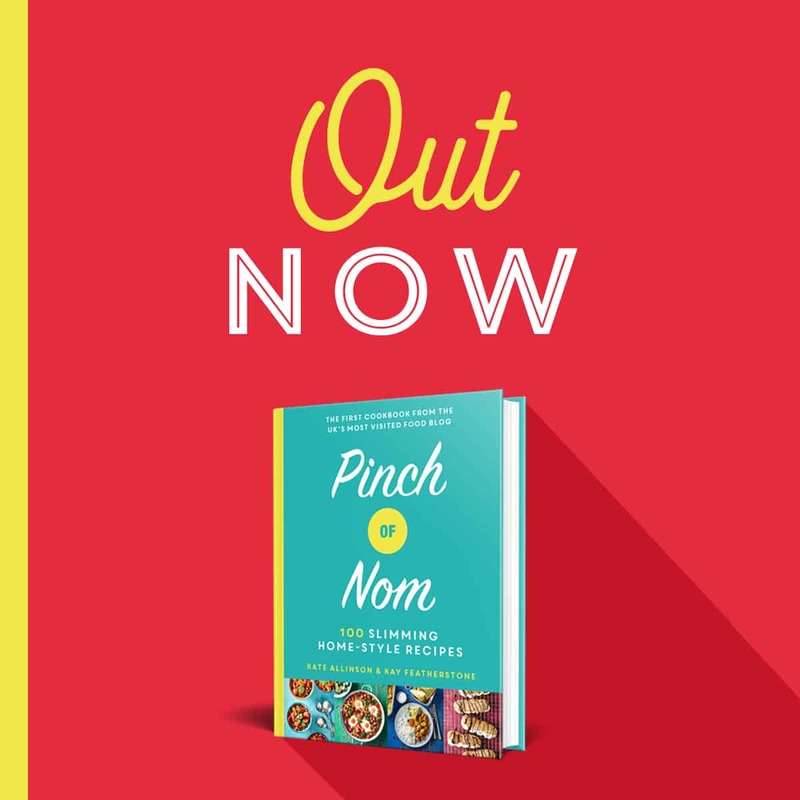 You can also find it here, on the Tesco website. 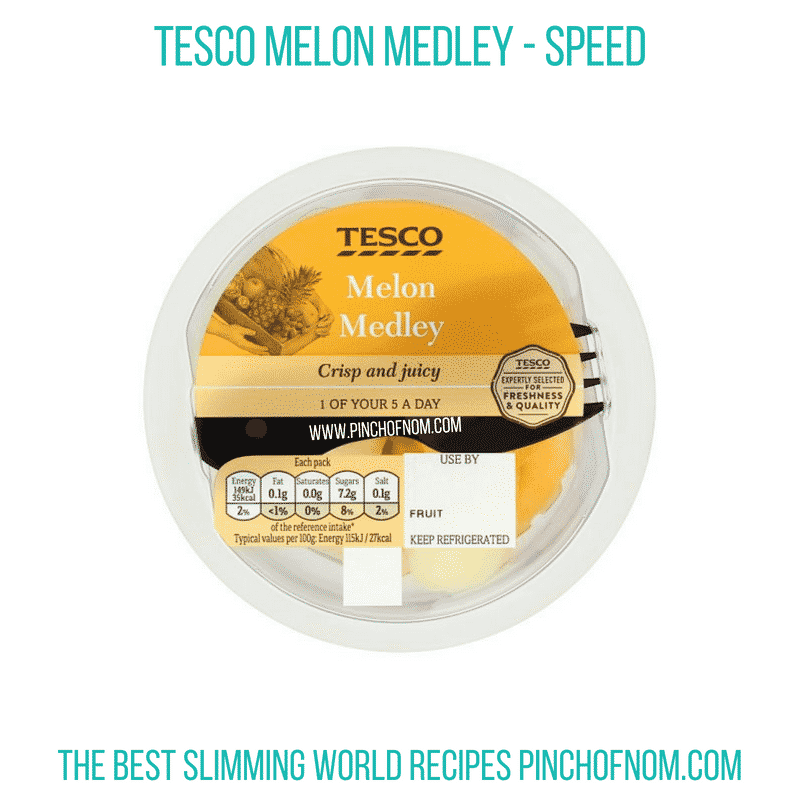 Melon is a great Speed Food choice if you’re following the Slimming World plan. My usual dilemma is to decide which melon to buy, as I like them all. The bonus is that all varieties are Speed Foods, so you can tuck in freely! This Melon Medley contains two varieties; Honeydew and Cantaloupe. Both are deliciously juicy, crisp and refreshing. Perfect as a snack, or to enjoy as a dessert after a meal. Tesco Melon Medley comes in a 130g pot and costs £1.00. You can find it here, on the Tesco website. Fruit pots are such an easy choice for a ‘grab and go’ snack if you’re out and haven’t brought your own supplies to stay on plan. Tesco have introduced this colourful and refreshing combination of watermelon and mango to their range of prepared fruit. Mango is a free food, and watermelon is Speed Food, so this is going to help you stay on track. 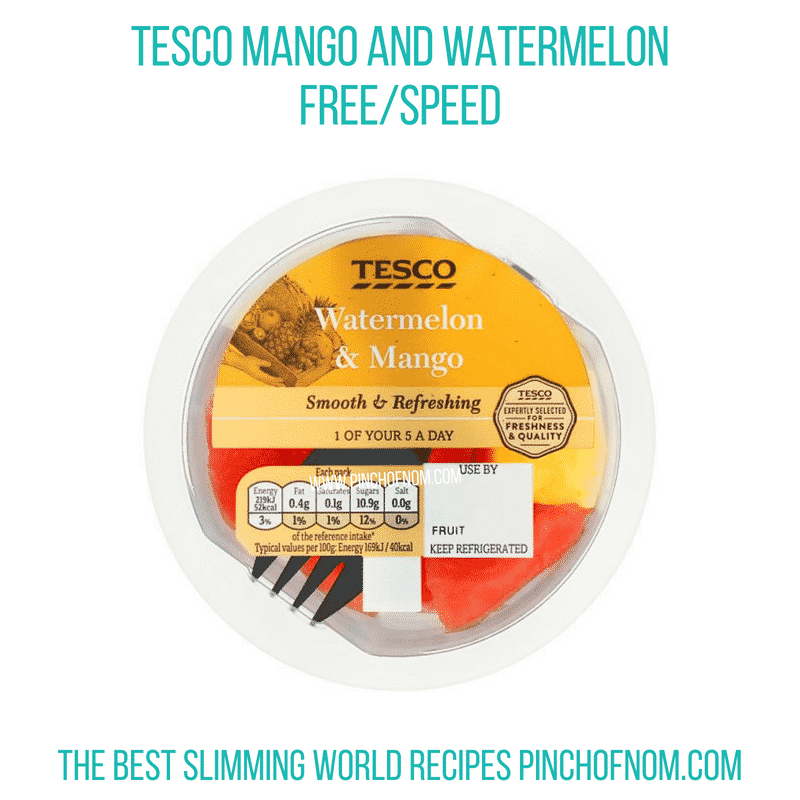 Tesco Watermelon & Mango pots cost £1.00 for a 130g serving. You can find it here, on the Tesco website. We discovered these Speciality Tutti Frutti blueberries in M&S this week and they sound really good, can’t wait to try them for myself! Apparently they have a really unique and aromatic flavour. 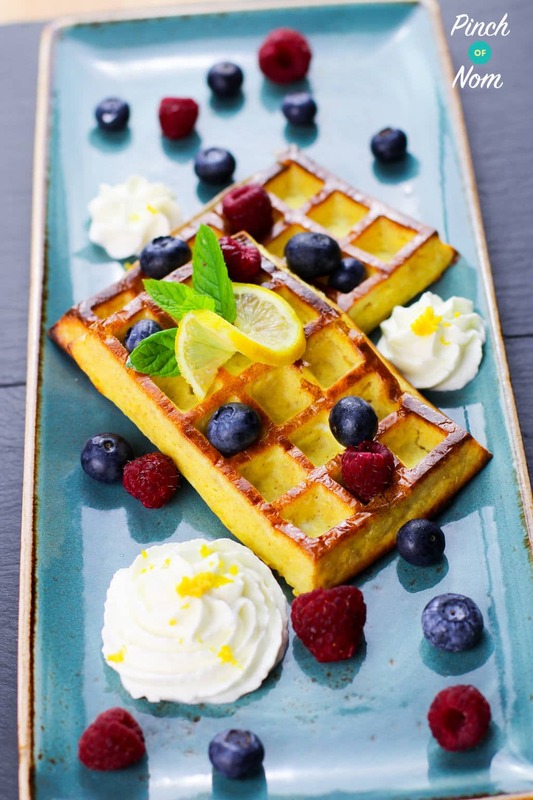 They would make a delicious addition to our Syn Free Lemon & Blueberry Waffles. 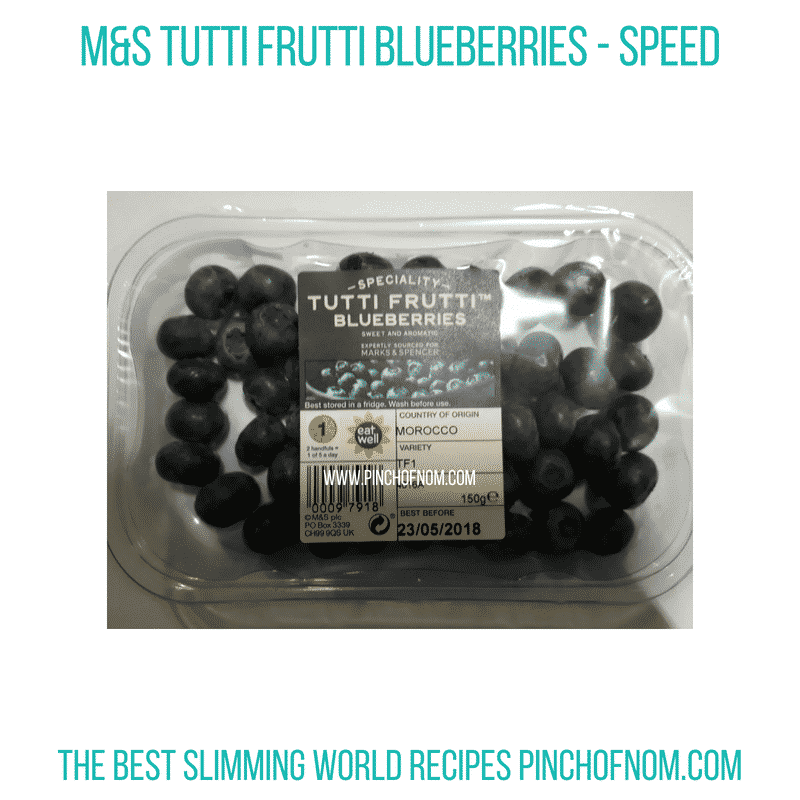 Blueberries were added to the Speed foods list by Slimming World in January. If you missed the grand announcement, you can read all about it here. This 150g punnet of Speciality Tutti Frutti blueberries costs £3.00 from M&S. If you’re an asparagus lover then you’ll be celebrating right now as it’s bang in season, so there’s a plentiful supply in the shops. 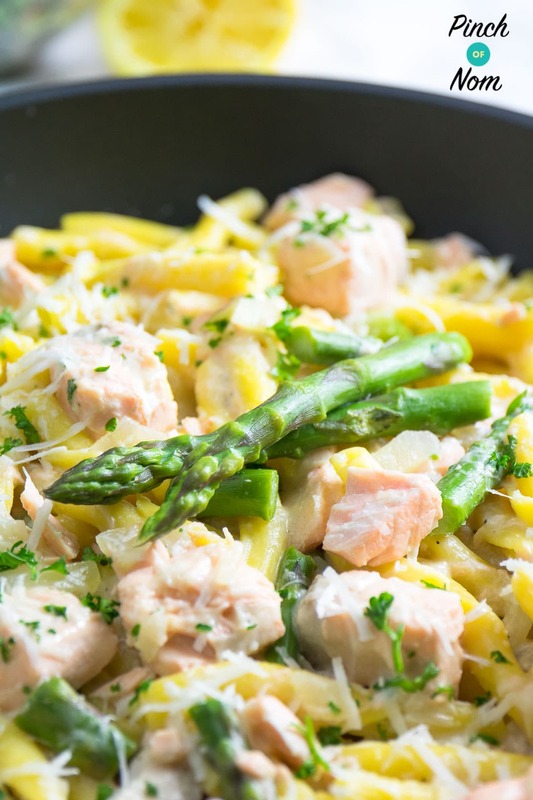 We have some delicious recipes that use it on the website, including our Syn Free Creamy Salmon and Asparagus Pasta, and the Low Syn Mozzarella and Asparagus Stuffed Chicken. Morrisons are selling Wonky Asparagus, as part of their Wonky veg range. It’s just as tasty as non-wonky asparagus, but at a really good price. It’s on the Speed food list, too! 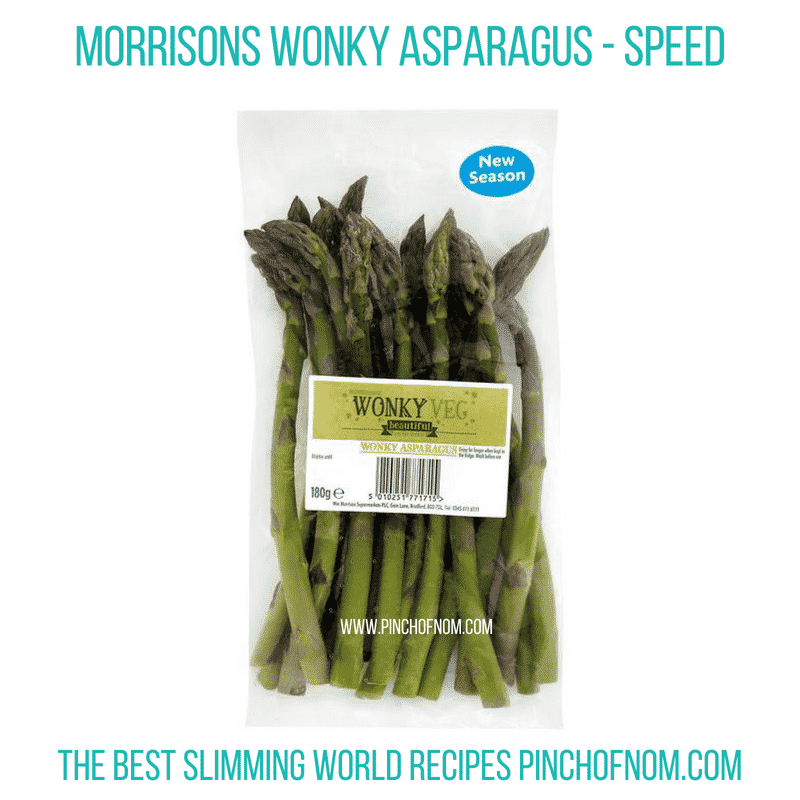 A 180g pack of Morrisons Wonky Asparagus costs just £1.00. Speaking of vegetables that are in season at the moment, we must include Jersey Royals. These are delicious potatoes, grown exclusively on the island of Jersey. These early season Jersey Royal new potatoes are now available in Morrisons. They have a delicate, nutty flavour and are delicious when served steamed as an accompaniment to any meal. 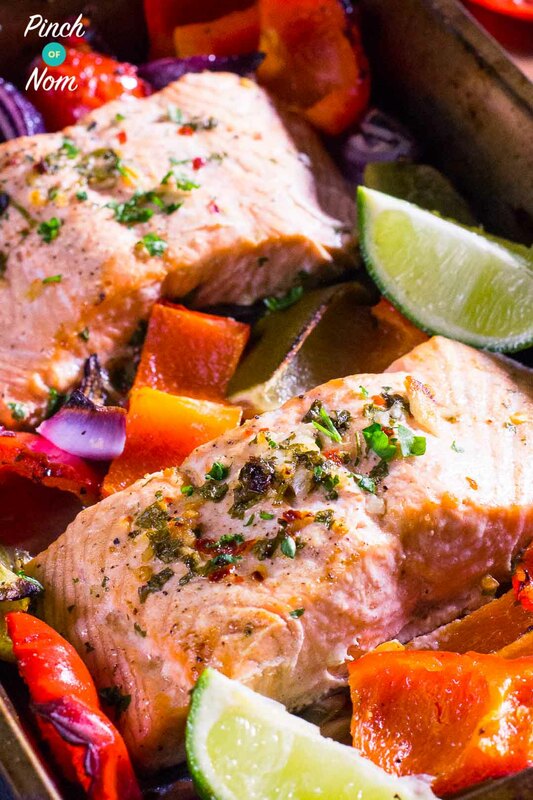 Jersey Royals would be super served with our Syn Free Chilli & Lime Baked Salmon. As with all potatoes, they are a free food, so they can be enjoyed as part of a food optimised meal. 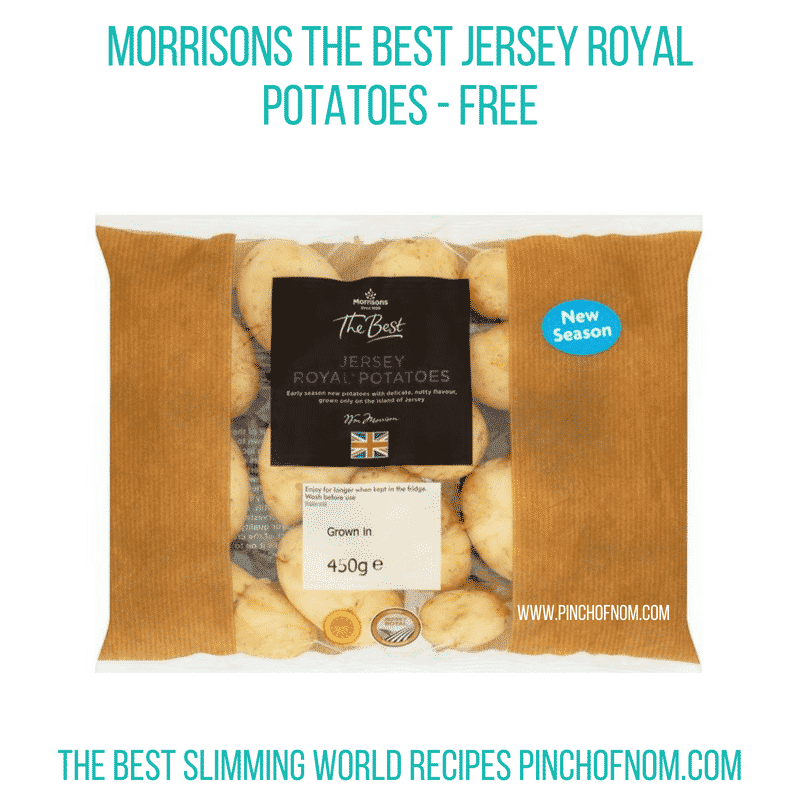 Morrisons The Best Jersey Royal potatoes cost £1.50 for a 450g bag. First up, we have Piri Piri King Prawns, which are Portuguese inspired, using Roquito Peppers. The heat rating is 2 chillis, so they shouldn’t be too hot to handle! Using the Syns calculator, these work out at 1.5 Syns per half a pack. They would be lovely served with our Syn Free Nando’s Spicy Rice. 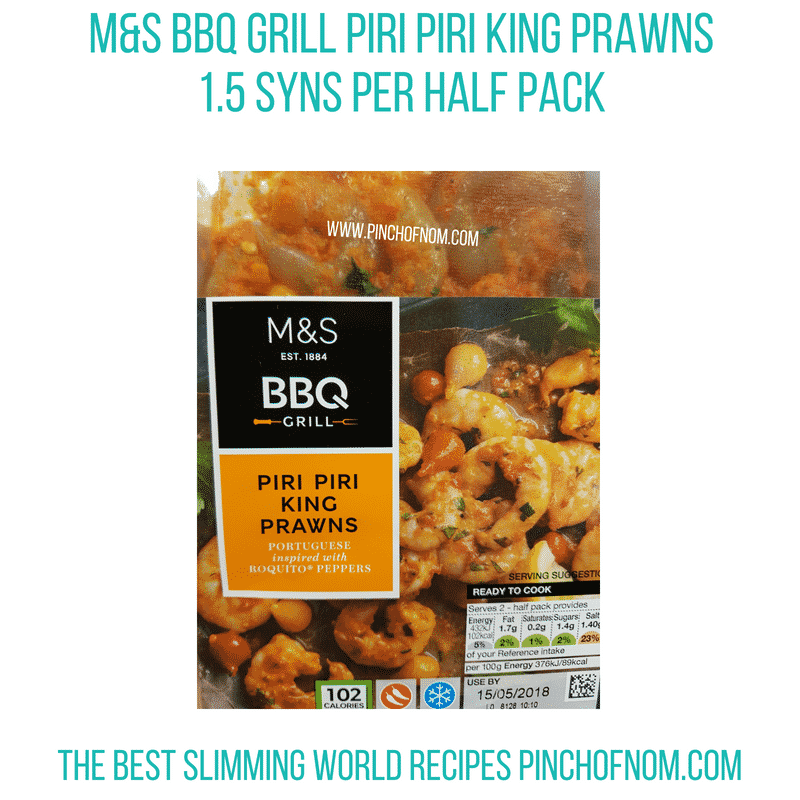 A 230g pack of M&S Piri Piri King Prawns costs £5.00. They are included in the 3 for £10 mix and match offer on any marked meat, poultry, fish and grill products. Prawns are a really easy BBQ option as they cook relatively quickly and are super tasty. Popping prawns onto a skewer keeps them all in one place and makes them easier to handle on the BBQ grill too. Happily, M&S have done the hard work for you by marinating them in chilli garlic and paprika, then threading them onto wooden paddle skewers for you. Job done! They are 1 Syn per pack on Syns Online. 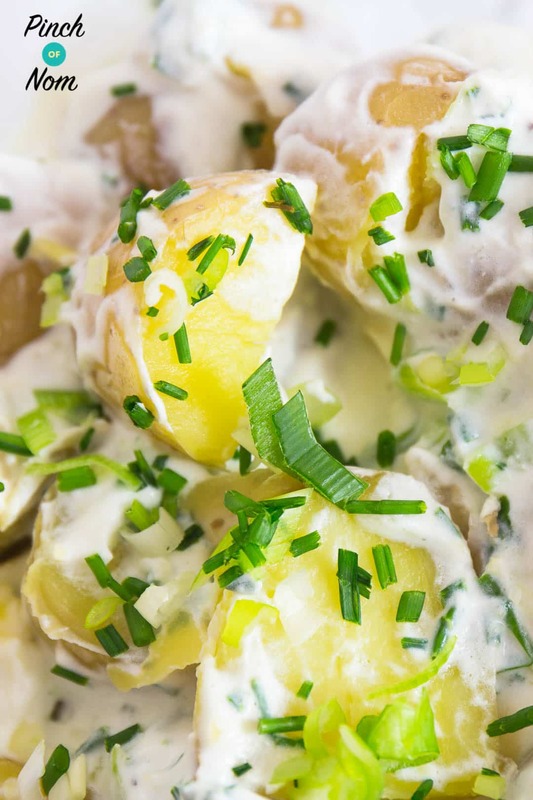 Try serving these with our Syn Free Potato Salad. 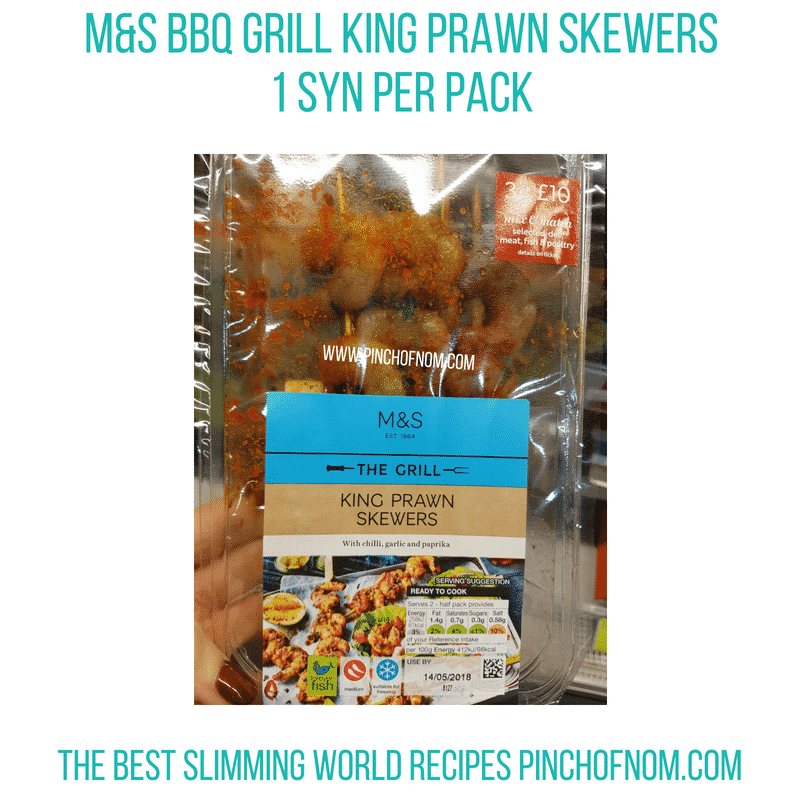 M&S King Prawn Skewers come in a 115g pack, which costs £4.00. They are also included in the 3 for £10 mix and match offer on any marked meat, poultry, fish and grill products. Fish is often overlooked in favour of sausages and burgers when thinking about barbecue food. 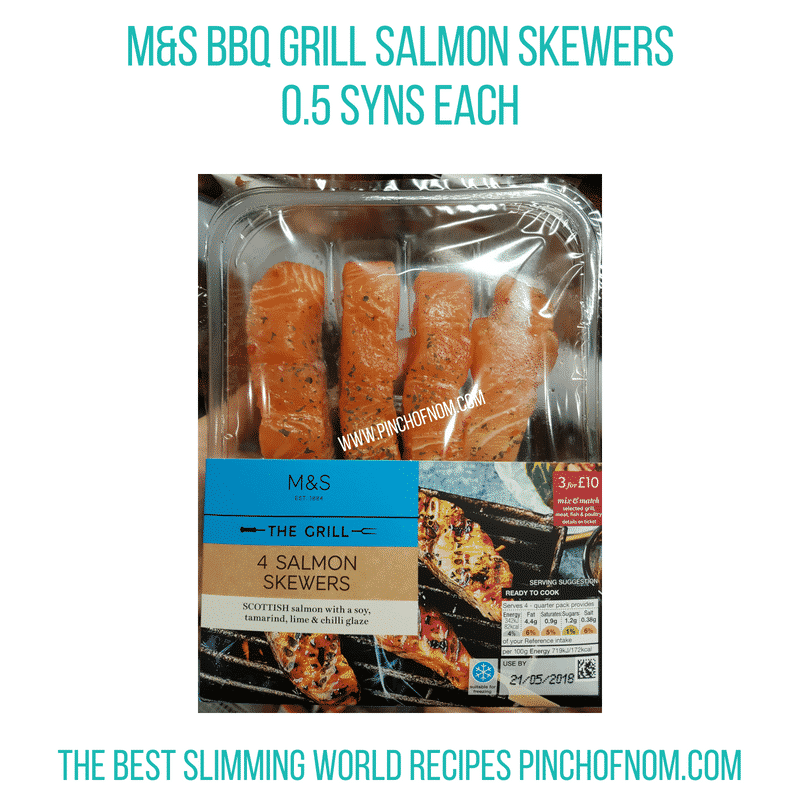 As you may know, we have a saying, ‘If it swims, it slims’, so we’ve included these M&S Salmon Skewers here. These skewers are simply made with Scottish salmon, in a soy, tamarind, lime and chilli glaze. They’re on the Syns Online app at 0.5 Syns each. A pack of four Salmon Skewers costs £4.50, and these are also included in the mix and match 3 for £10 offer. If you enjoy cooking al fresco, here’s another delicious option for your BBQ from M&S. These Coronation Chicken Flatties are made from British chicken, in a mango marinade with a coronation drizzle. Chicken can be flavoured so many ways for a barbecue. 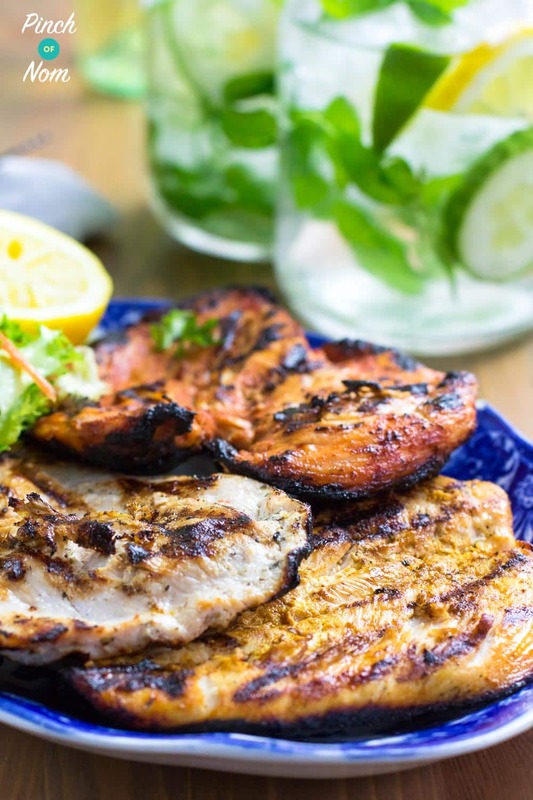 Check out some of our ideas here with our Syn Free BBQ Chicken Steaks. 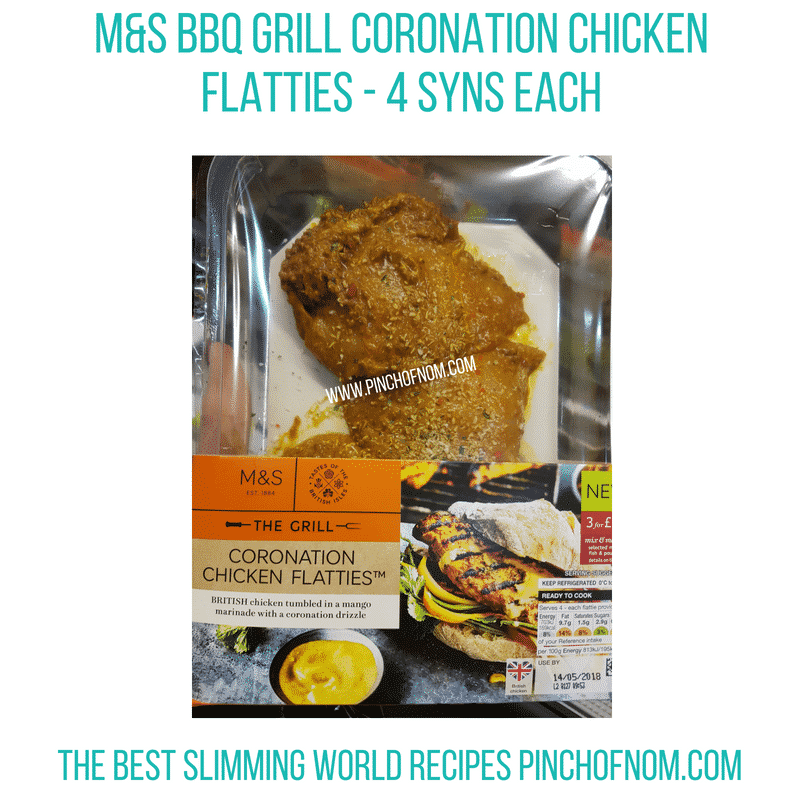 M&S Coronation Chicken Flatties are sold in a 346g pack and cost £4.00. Once again, they’re included in the 3 for £10 offer. They work out at 4 Syns each using the Syns Calculator. When I spotted these in the BBQ section of the M&S food hall this week I was convinced they’d be really high in Syns. Described as ‘British Chicken, with a salt, pepper and herb rub and a sticky Suffolk beer and honey glaze’, in my mind the syns alarm bells were ringing. 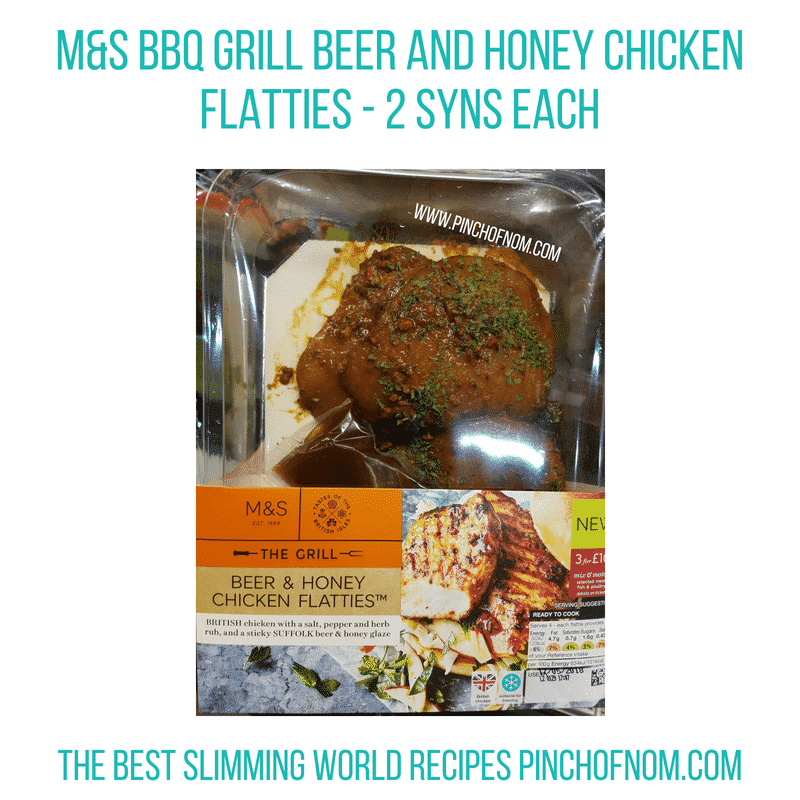 When I checked them on the Slimming World app, I was delighted to find that they are only 2 syns each. Happy days! They cost £4.00 per pack and are part of the mix and match 3 for £10 deal. Kebabs have been all the rage recently over in the Facebook group! 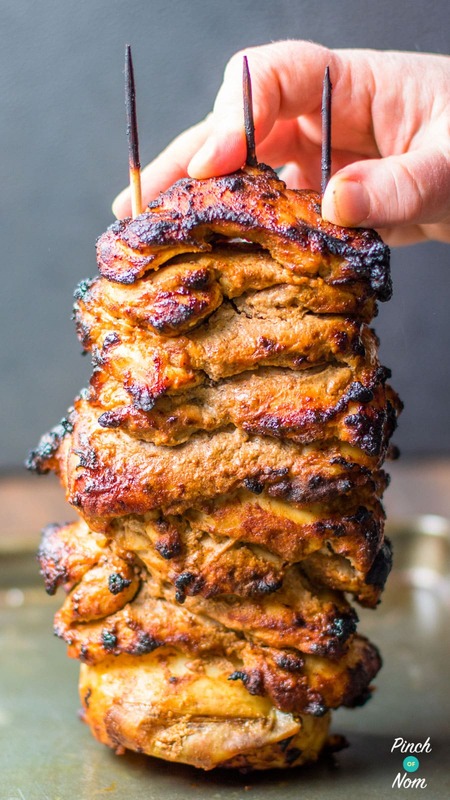 Lots of you have made our amazing Syn Free Chicken Kebab. Kebabs are great for the barbecue too, as they make it easy to move and turn the meat for even cooking. Take a look at our Syn Free Beef Kofta Kebabs or Syn Free Chicken Gyros Kebabs for even more choices. 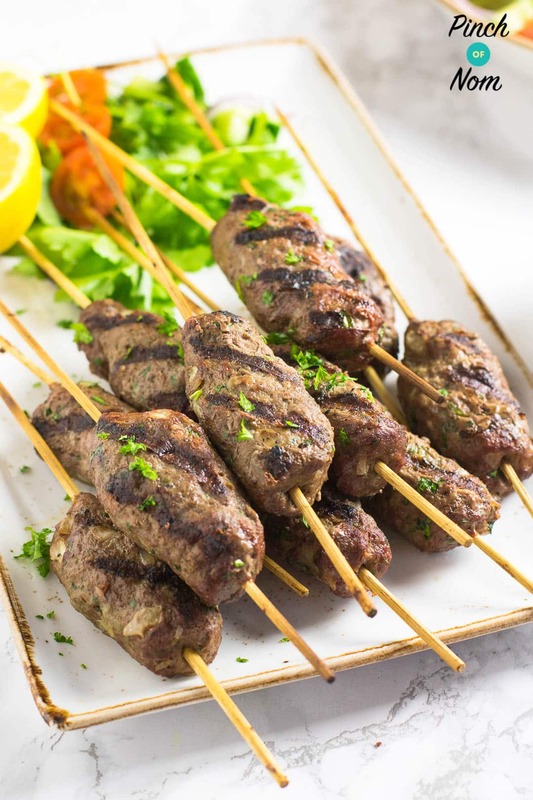 These Skinny Beef Shish Kebabs from the M&S The Grill range are made from less than 3% fat British beef, seasoned with Chilli and Cumin and with a tomato dressing. 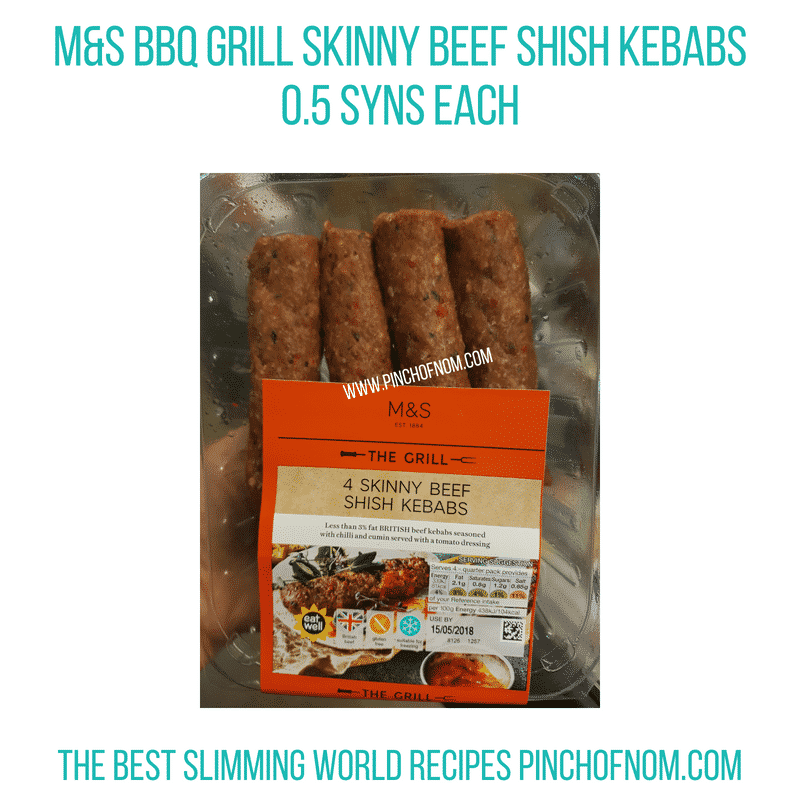 M&S Skinny Beef Shish Kebabs are part of the mix and match offer of 3 for £10, or £4.00 a pack. They’re on the Syns Online app at 0.5 Syns each. I spotted these in Morrisons this week and thought they’d be great for a quick lunch, or even a picnic! Ready to eat, hot smoked honey roast salmon on a skewer. 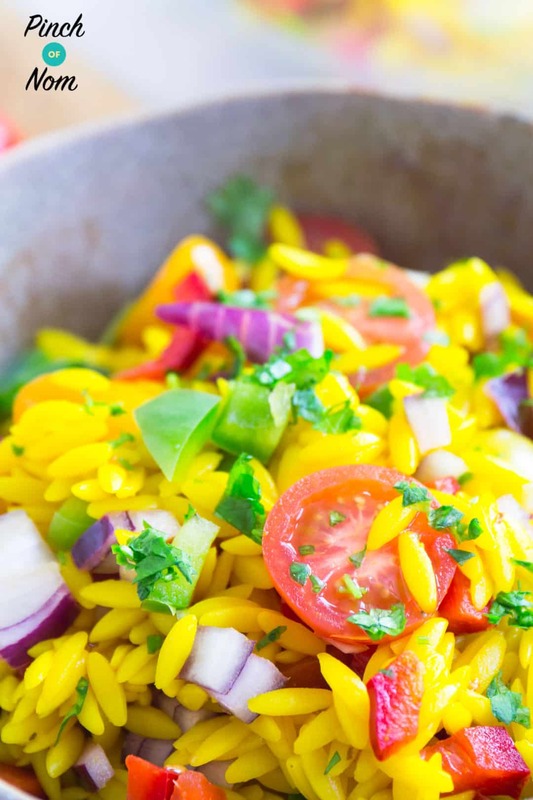 These would go really well with our Syn Free Orzo Primavera Pasta Salad. 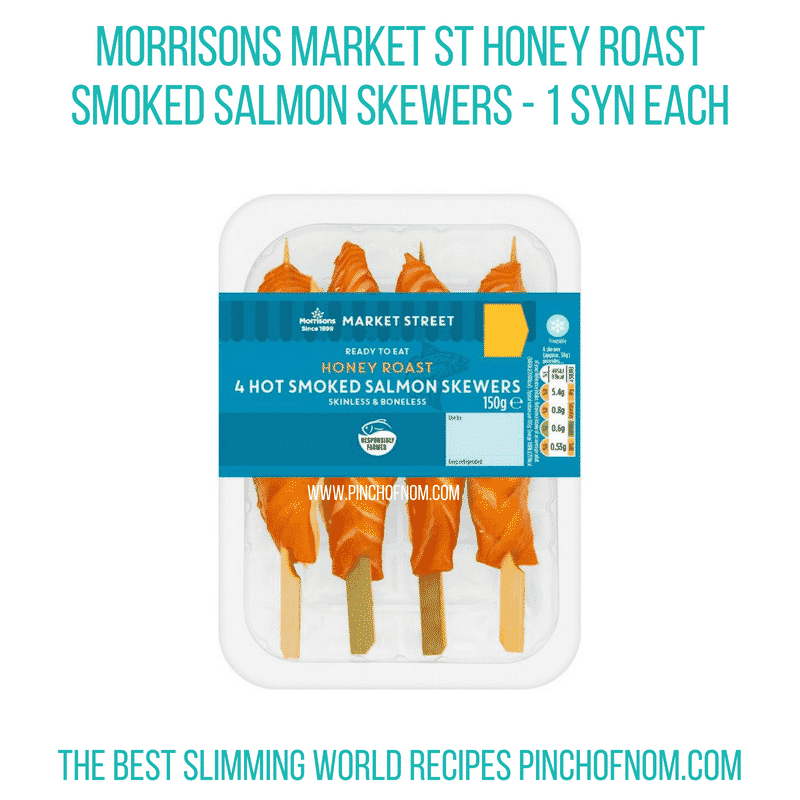 Morrisons Market St honey roast smoked salmon skewers work out at 1 Syn each using the Syns calculator. They cost £4.00 for a pack of four skewers. 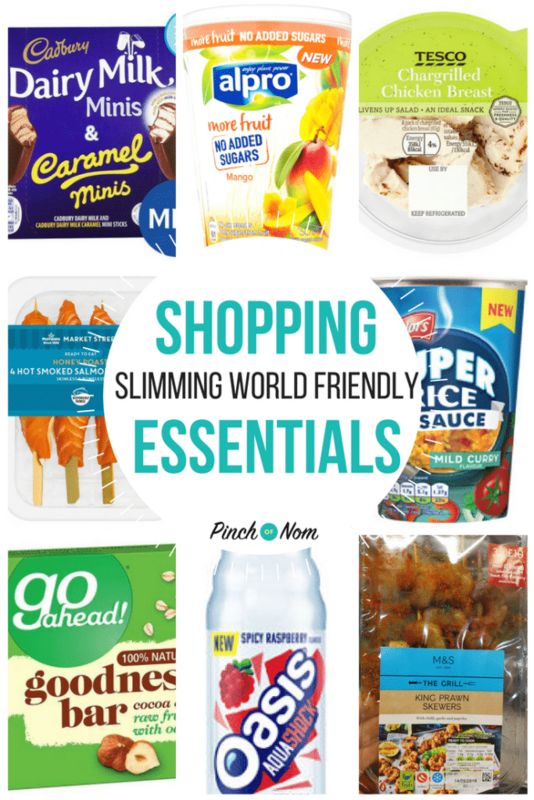 We always try to include alternative Slimming World friendly products where we can in the Shopping Essentials lists, and this week is no exception. 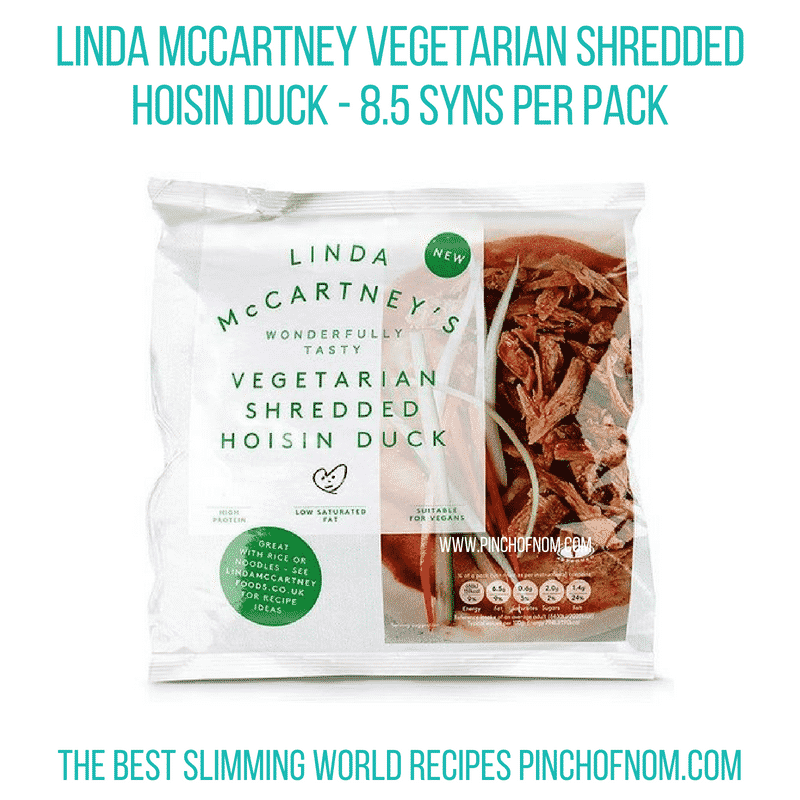 Linda McCartney Vegetarian Shredded Hoisin Duck is now available from Ocado. It’s high protein, low saturated fat, vegetarian society approved and suitable for vegans. 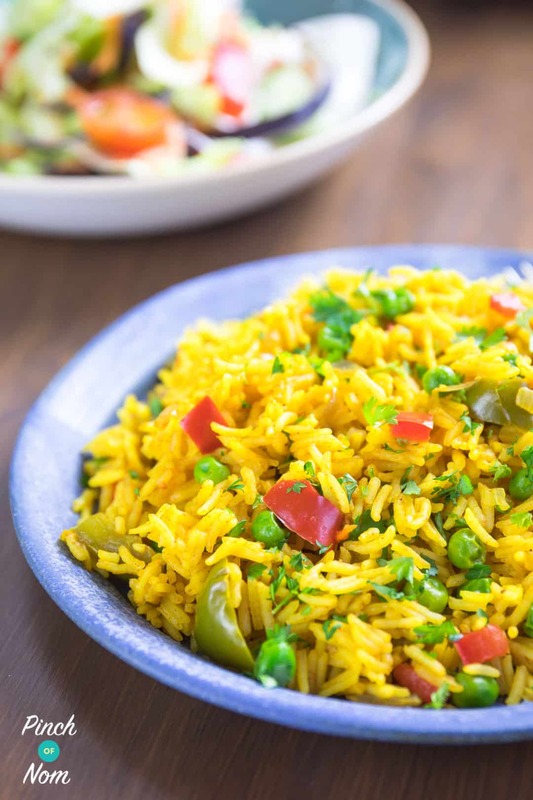 You can stir fry it with vegetables for a really quick meal, perfect to serve with rice of noodles. It’s on Syns Online at 8.5 Syns per pack. It’s available in a 300g pack and costs £2.51 from Ocado. 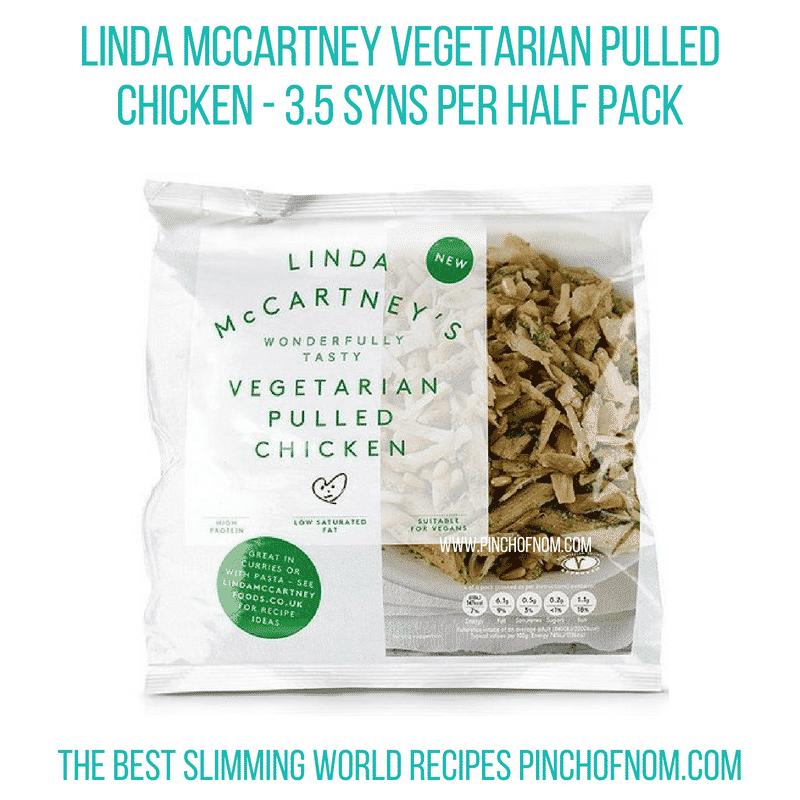 We found another new Linda McCartney product from Ocado this week. This is also a stir fry product, so great for a no-fuss meal as it cooks really quickly from frozen. 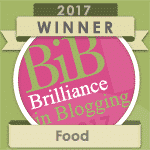 As with the Shredded Hoisin Duck, this is high protein, low saturated fat, vegetarian society approved and suitable for vegans. It’s on the Slimming World website at 3.5 Syns per half pack. Ocado suggest that you can use this in curries or with pasta. It costs £2.51 for a 300g pack. If you can’t have wheat and have to eat a Gluten Free diet, you’ll be familiar with the BFree range of foods. These BFree Stone Baked Pitta breads are not new, but the more places that sell them, the better! 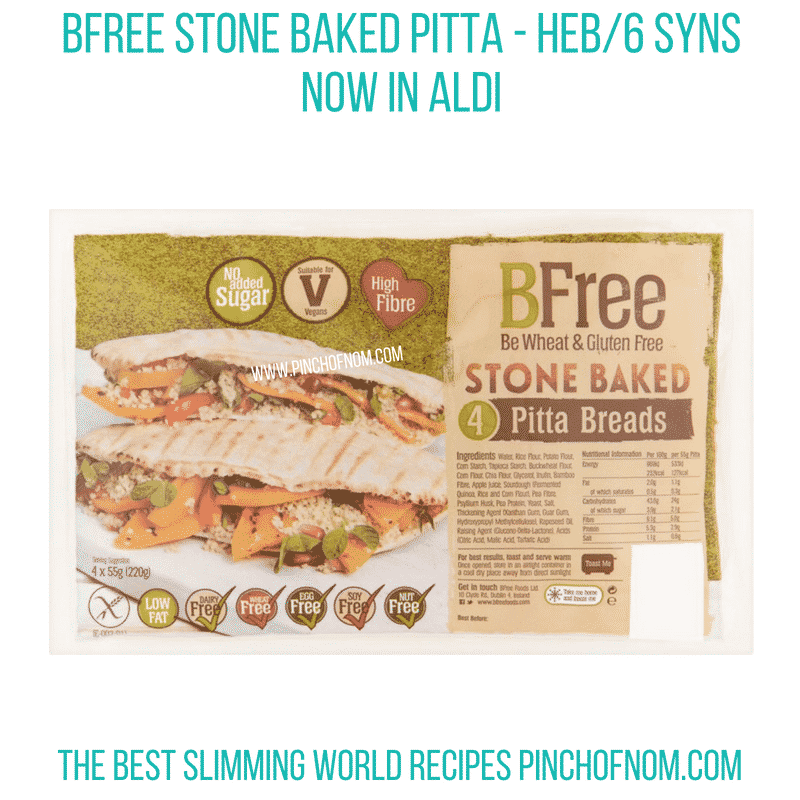 Aldi have now begun stocking BFree Stone Baked Pitta Breads. You can have 1 of these as a Healthy Extra B choice, or 6 Syns. A pack of 4 x 55g BFree Stone Baked Pitta breads costs £2.25 in Aldi. 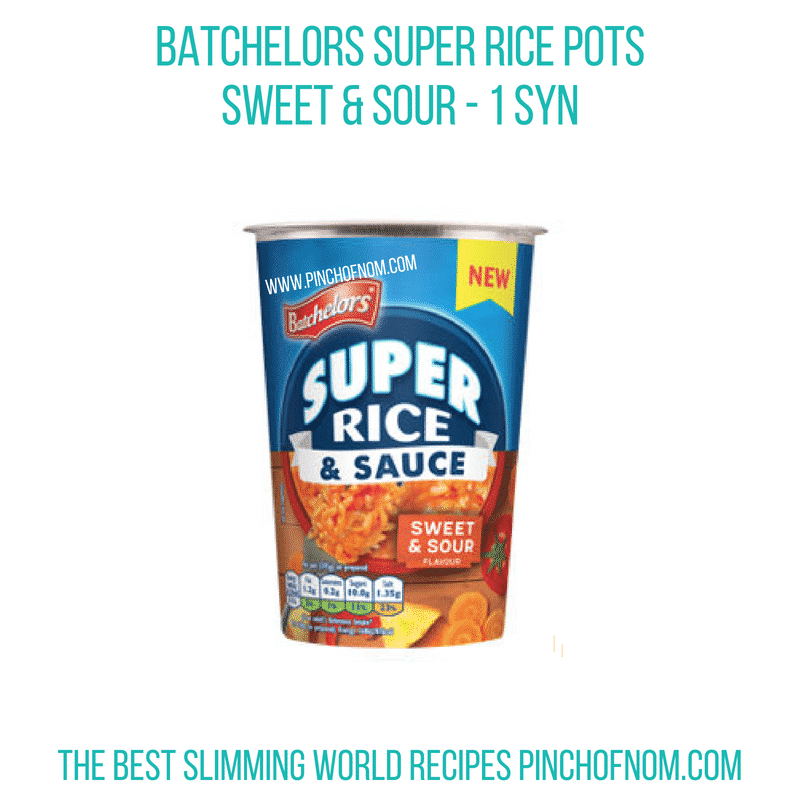 At the end of January this year, Slimming World recalculated the Syn values in many brands of Instant Noodles and Pasta Pots. 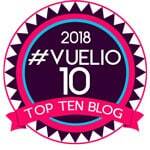 If you missed that announcement, we published an article that tells you more, which you can read here. Whilst they won’t suit everyone, you might find these useful for a quick lunch idea. 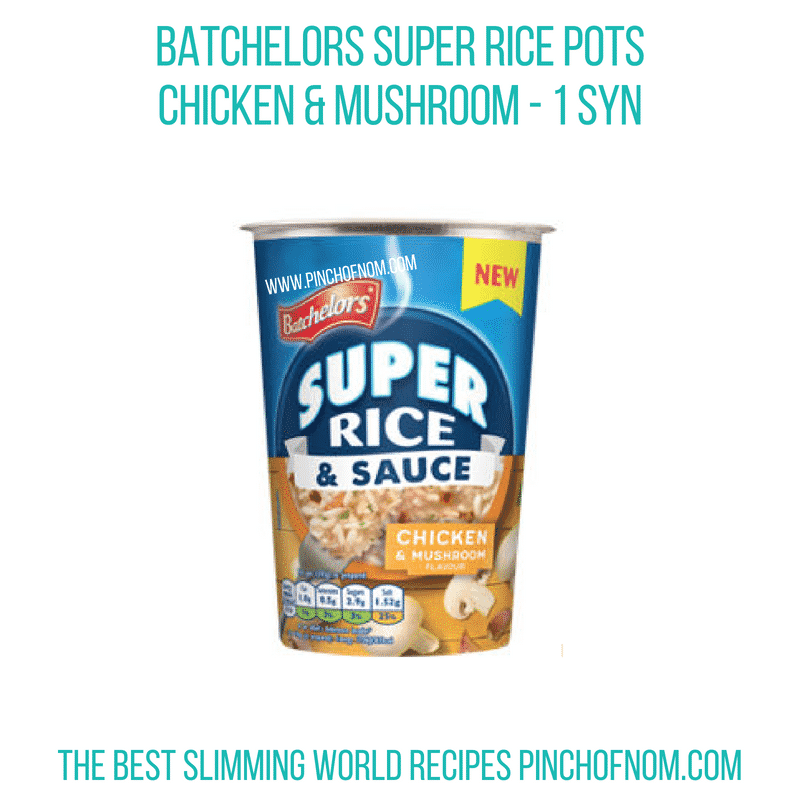 They cost 50p per pot and all Syn values are on the Slimming World website. Caroline from our Facebook group shared these Waitrose 30% lighter mature cheese sticks in the group this week. 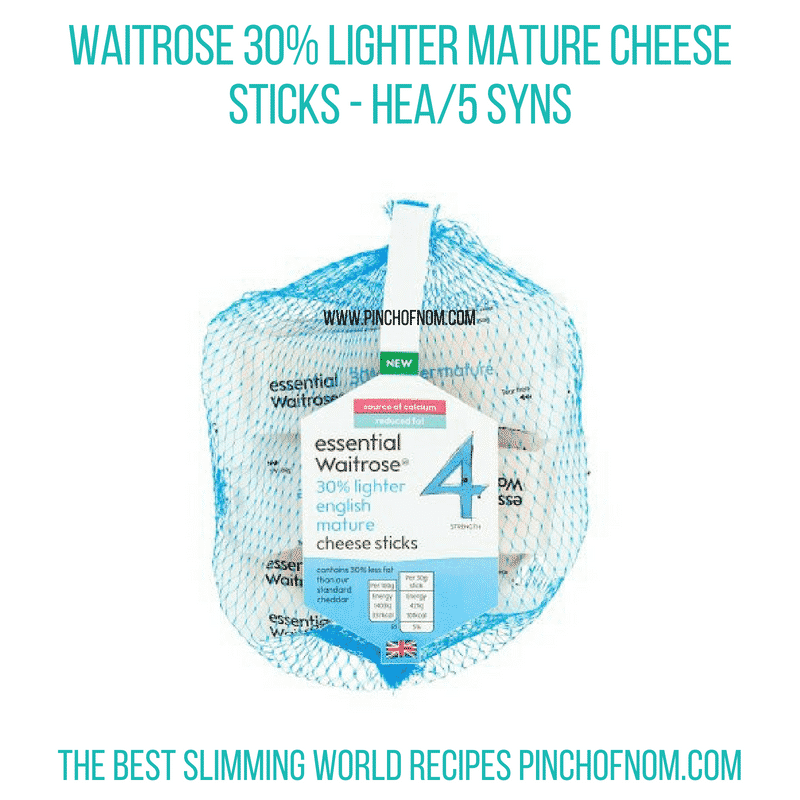 Conveniently wrapped as individual sticks to stay fresh, they are on the Slimming World website, one cheese stick is a Healthy Extra portion, if not using as an HEA they are 5 Syns each. A pack of 5 x 30g portions is currently on offer in Waitrose for £1.60, usual price £2.00. These Goodness bars are new to the Go Ahead range. Made from 100% natural ingredients with no added sugar, they only contain naturally occuring sugars. One of the main ingredients is dates, which give the bars their natural sweetness, but the flavour is not overly sweet. The bars are Gluten Free and suitable for vegetarians. 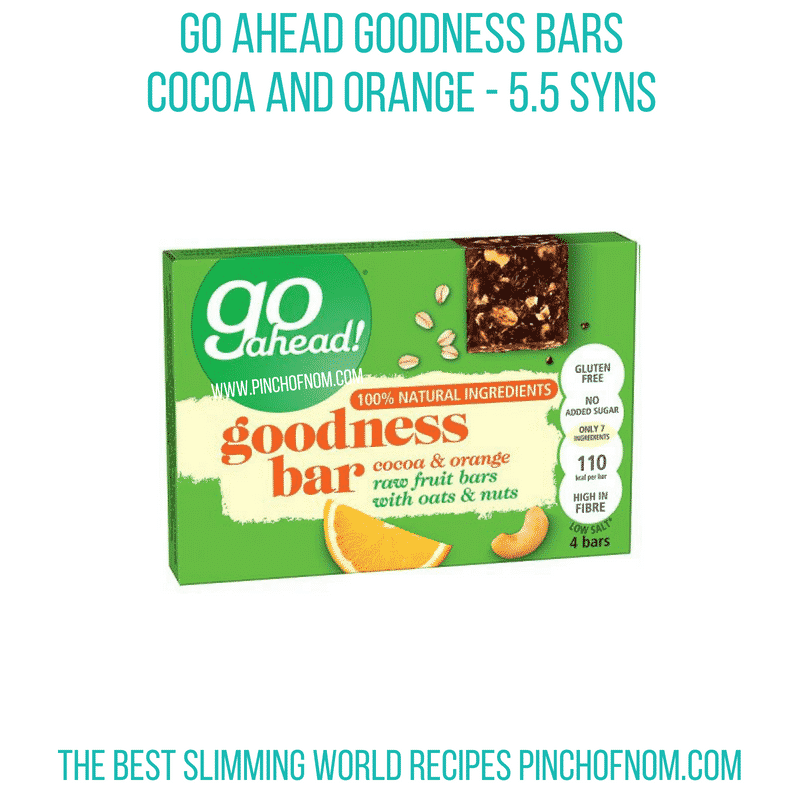 Both flavours are on the Slimming World website, listed at 5.5 Syns each. There are 4 x 30g bars in a box and they cost £2.00 in Sainsburys. With a great range of dairy free products for those who can’t eat, or would prefer not to eat dairy, many people choose Alpro products. 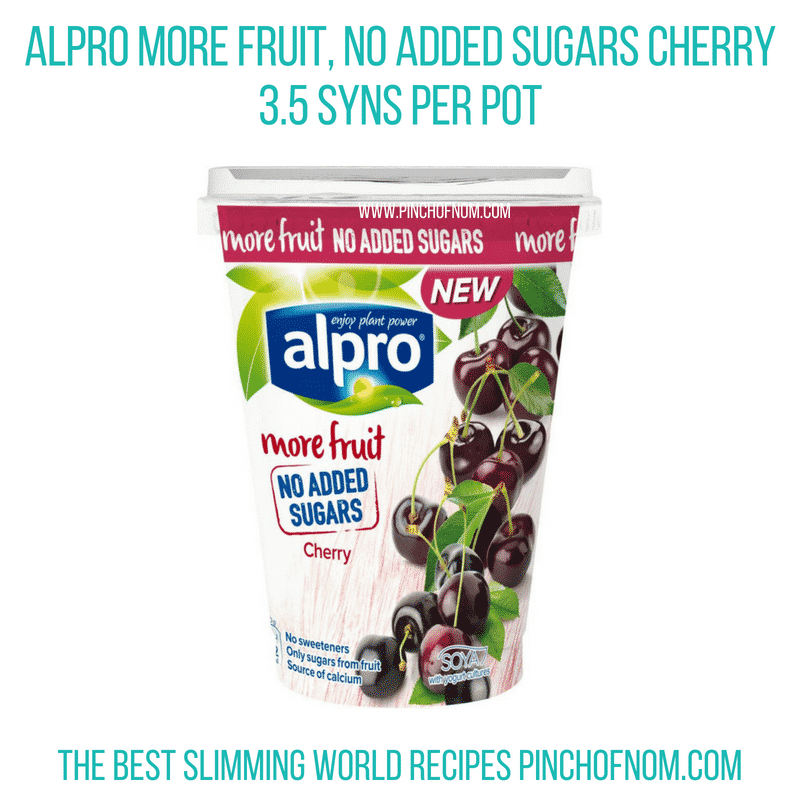 New in Sainsbury’s this week is Alpro More Fruit, No Added Sugars; a delicious plant-based alternative to yogurt without any added sugars or sweeteners. It simply contains naturally occurring fruit sugars. There are two flavours, Alpro More Fruit Mango, and More Fruit Cherry. 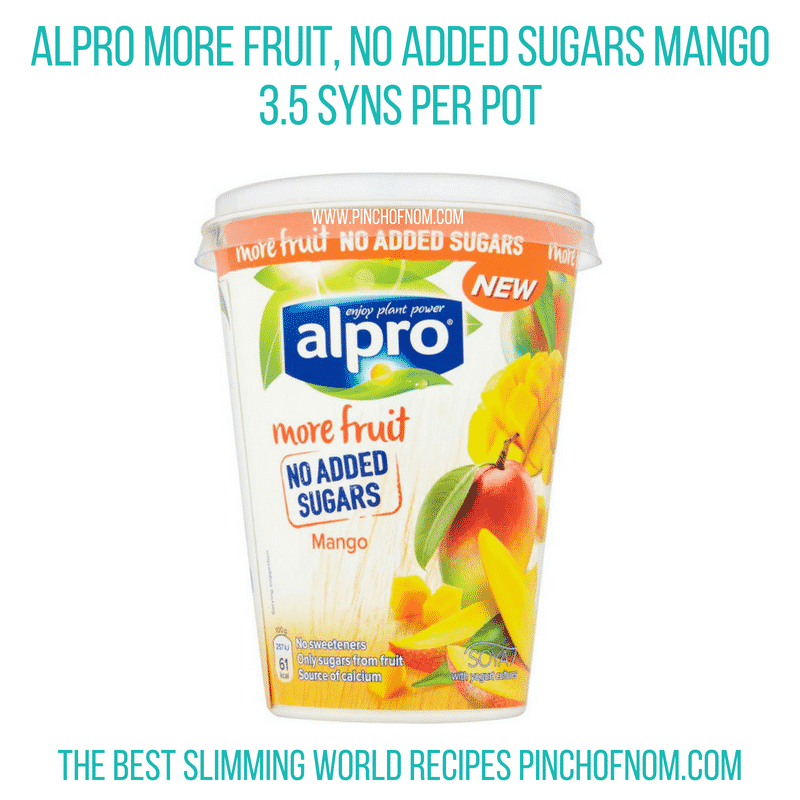 Mango flavour is already on the Slimming World website at 3.5 Syns per pot. I calculated the cherry flavour at 3.5 Syns using the Syns Calculator. They are available from Sainsburys, priced at £1.70 for a 400g pot. If you’re looking for something a bit different to drink, Oasis Aquashock is new from The Coca-Cola company, and this really does sound a bit different! It’s described as ‘a great tasting refreshing flavoured water with a twist, providing a delicious taste with a pleasant warming or cooling sensation’. It’s a still Raspberry and Chilli Water Drink with no added sugar, just natural flavours. It works out free on the syns calculator. 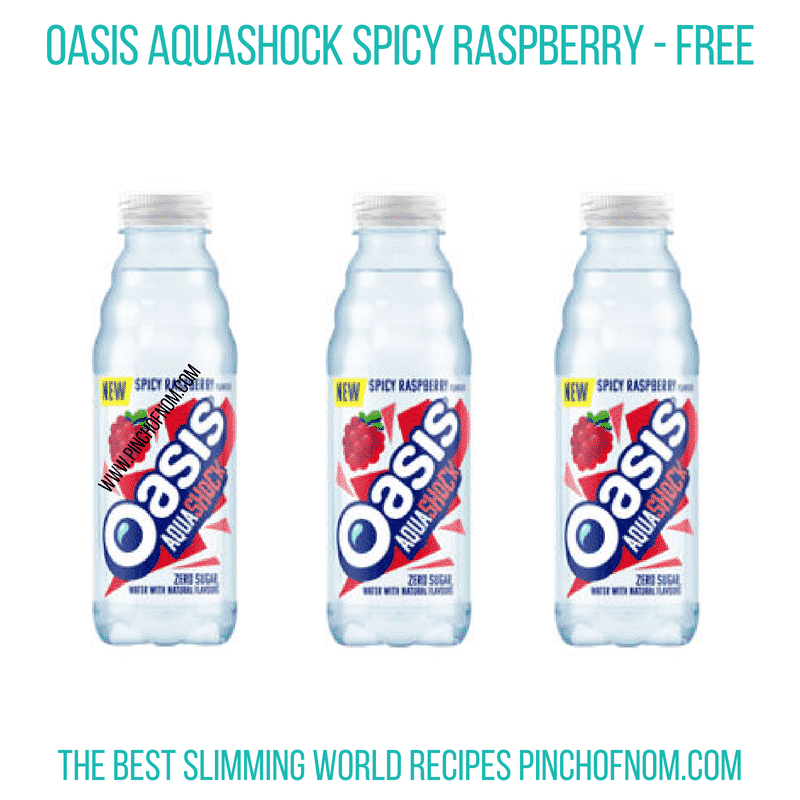 You can find Oasis Aquashock Spicy Raspberry water in Asda, priced at 69p for a 500ml bottle. 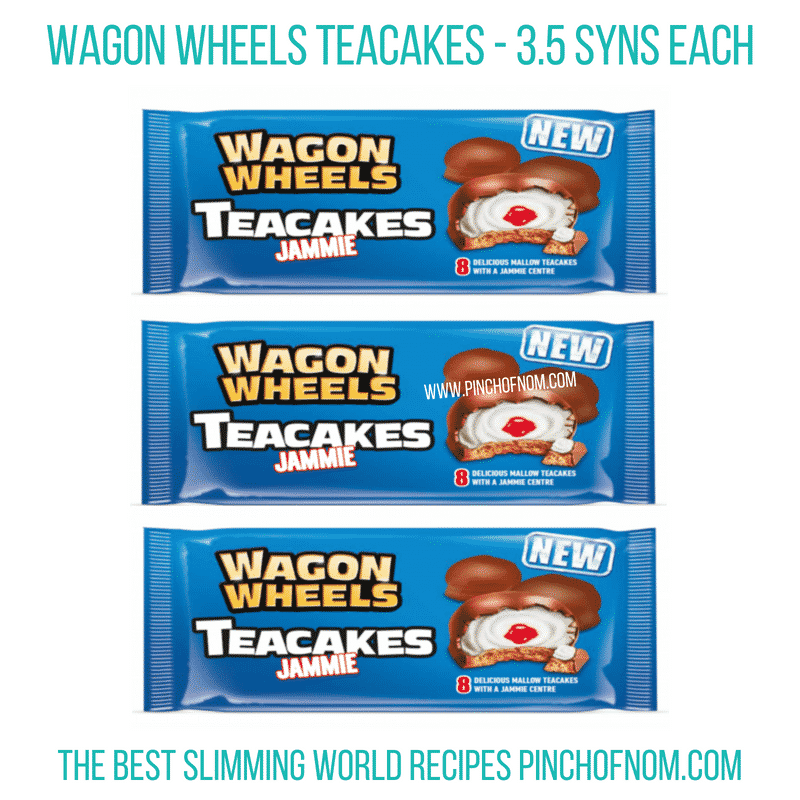 This has got to be a winning combination if you love wagon wheels or those chocolate and marshmallow teacakes! Ooooh, yes please! Delicious mallow teacakes with raspberry flavour apple jam filling, covered in chocolate flavoured coating. All this for just 3.5 Syns per teacake. You can find these in Morrisons, priced at 70p for a pack of 8 teacakes, but currently on offer at 2 packs for £1.00. Our Shopping Essentials Top Pick is a featured highlight of the week. This week we’ve chosen Cadbury Dairy Milk and Caramel Ice Cream Minis. 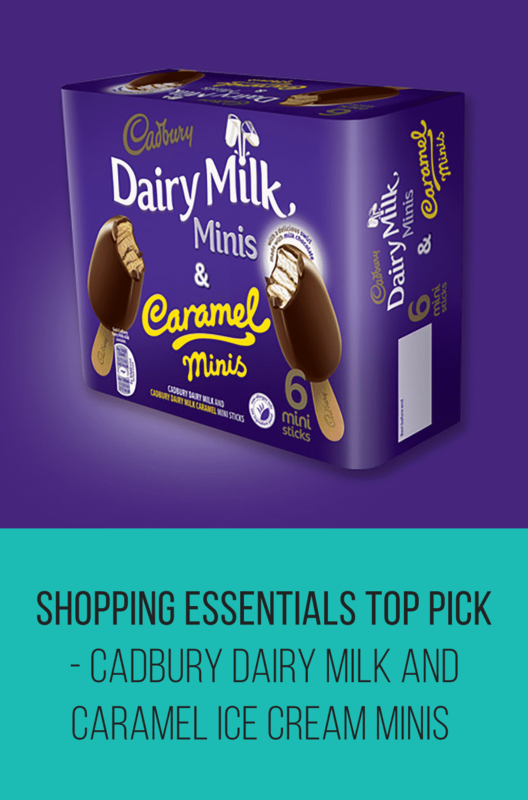 You can read more about these Cadbury Dairy Milk and Caramel Ice Cream Minis here, in the Shopping Essentials Top Pick article. So glad you enjoyed it, Grace!